There's a lot of fun stuff going on in RNA and DNA science, inside and outside EteRNA! In chat, e-mails, and some forum posts, I hear about new advances in DNA origami, novels involving chromosomes, and jokes on paper-writing. How about collecting these links into one thread -- this one? I'll try to get this thread to be 'sticky' so that its one of the first posts you see when you enter getsat. JandersonLee sent me this cool article today. It is about scientist now being able to watch our bodies own self-assembling nanomachines at work. NOVA science have made the coolest video on RNA I have yet seen. It explains why RNA holds big promise to medicine and tells about how RNAi was discovered. I also found this new free biology course from MIT. You can read about the course here and download the course materials and videos from this page. Though I like the idea of new material, I'm very fond of MIT's older introduction to biology. It holds a lot of lectures with relevance to our game. Eric Lander makes me want to study biology and makes me feel welcome. Thanks Eli. I saved that link and will look it up on bus ride in the morning. EVER REMEMBERED TO THANK YOUR BACTERIA? JandersonLee found this fascinating article on why you should. It is about the bacterial part of our genome. NIH is aiming at getting a picture of our bacterial companion cultures with the Human microbiome project. It is no coincidence the project is such a close namesake of The human genome project. It is the so far missing piece of the human genome. An other story from the medical frontier is, that genom scans on drug resistent bacterias, can now be made at a price and in a time frame, that can make it of use to clinicians. Thanks to JL for these nice links. Amazing stuff! I thought I'd point out that the same sequencing technologies that are revolutionizing our views of microbia in humans are the same ones that we're developing for EteRNA's experimental feedback. We've been thinking -- can other areas of science, including characterization of the microbiome, be fit into the EteRNA template? It appears there are not only RNA switches in nature, but DNA switches too. I had no idea. The cartoon below is not a totally unrealistic scenario in EteRNA. Adrien Treuille has long surpassed former Ignobel Prize reciever for putting most author names on a science paper. The cartoon comes from this page, that holds other great science cartoons. A Key to Scientific Research Literature is about what scientists say and what they really mean. It is a funny and unserious intro on how to read science papers. Have you ever wondered why you sometimes can't understand even one single sentence in a science article? Don't despair - it might just have been written by a computer algorithm. Check out the episode A twisted take on Turing from the podcast Math Mutation. At last an interesting peek into the world of science papers. Commenting On Scientific Papers: How Come No One Does It? Praise of chromosome "folly" is a charming adventure into the land of science. It holds many surprises, some even with relevance to RNA. I wasn't aware beforehand that the chromosomes excert such control over our genome. It is an easy read introduction to the workings of the cell. Not only is it science as literature, it is a history of science and the tale of how we came into being. It is a magic book. Several times it left me with a sense of weightlessness. With a bit of luck you might be able to get your library to borrow it from a library that has it. Amazing, I have just seen plant cells in a microscope on my own! This lovely old piece of a microscope was thrown out, as some of the things were broken. In the meantime I got lucky fixing the viewing piece that had taken a blow and was bent. I still had no glass slides to put things on, which was why I picked the nearest leaf big enough to hold itself. It was from an orchid. That would prove to be a lucky choice. I can now share that my jewel orchid has cells with 6 edges in its leaves. Orchids turn out to have some of the biggest plant cells, according to Adam Rutherford. I just saw his excellent documentary about the cell and it’s discoverers. It followed as a bonus to the BBC documentary "The story of Science" I bought recently. YouTube has small taste of The Cell - The hidden kingdom, and Amazon has the rest, should you be interested. I found this article and I love it because it gives me a glimpse of how RNA behaves and explains it in an understandable way. Highlights from the article. "RNA is very similar to the human body in its construction, in that it's made up of limbs that are connected at joints," Al-Hashimi said. The limbs are the familiar, ladder-like double helix structures, and the joints are flexible junctions. The article sums up the groups work. This is the part of the article I like the best, as it reveals some of RNA's secrets. Even more it gives high hopes in relation to finding fitting drugs. In earlier work, Al-Hashimi's team determined that rather than changing shape in response to encounters with drug molecules, RNA goes through a predictable course of shape changes on its own. Drug molecules simply "wait for" the right shape and attach to RNA when the RNA assumes the particular drug's preferred orientation, Al Hashimi said. Here is a link to the Al-Hashimi Research Group and the rest of their work. Our lab interacts a bit with the Al-Hashimi group -- as we move to 3D problems (in 2013), we'll be able to apply some of their slick experimental methods to little RNA junctions that we design. Should be fun! Al-Hashimi group have been there again. This time with some cool news about RNA switches. It's an interesting read. I love this sentence about RNA: "Once believed to merely store and relay genetic information, RNA is now known to be a cellular Swiss Army knife of sorts, performing a wide variety of tasks and morphing into myriad shapes." I found a really nice educational series from Howard Hughes Medical Institute. It is an understandable introduction to the genetics field. It holds some of the history of the human genome project and dreams for the future too. Eric Lander is one of my science heroes. Even better, the Howard Hughes Medical Institute has made a teaching series specifically about RNA. It is called: The double life of RNA. The lecture series are great and a lot of excess material follows them. Among it some very good explanation about what microarrays are. They are doing a great job of advancing science literacy. Though the material is not exactly new, it is brilliant and fun. A librarian friend of mine just pointed me to a collection of free educational courses. This one looks very good from the EteRNA perspective. Charles Allison mentioned LearnersTV, another great page with free education. Just want to point the attention to that this course on nanotechnology has started. It is good stuff. Check it out. This awesome picture by Carolyn Larabell was found here. I went and bought glass slides for my microscope. I have read yeast cells were big, so I knew I had a chance with them. I diluted some yeast in water and at first the cells were moving wildly around. Then I put a top glass on and they laid totally close, almost in a pattern. They are very tiny and regular. The light shone some pretty colors through them, they are neat. I like them, I want a closer look. My microscope is x200. Bill Zhu asked me earlier and made me calculate how much it enhances. I got lucky when I mentioned my discoveries in the chat. Janelle, a retired nurse, started giving me tips on what to to do. Here is what she told me: Eli, scrape your finger and look at that under the scope...try a dry mount and a wet mount. Or the top of your hand or arm. You'll be amazed at what you see! janelle: Well, why not and try? I did see them a bit better with coffee. Janelle asked if I had food dye, which was when I remembered the colored ink for refilling a printer and no printer for it. She said it should be usable, when diluted down. 20 minutes of chat later I discovered that dead yeast cells have another just as distinct pattern. They were clumped together in groups. The incandescent lamp was so hot that it had killed off my sample. My microscope speeds up time. Another thought crossed my mind. I think I know what killed the lab rat. Curiosity. I later asked Janelle, as I got doubts, if yeast cells really could move. I was thinking that perhaps my adding of the drop to the glass slide also added the motion. Janelle said that the light heating the water could also be a cause of the movement I saw, in addition to the water drop moving. If you want to know more about yeast, here is the adult version by Andrew Murray. Janelle donated the beginners version. Edit by Starryjess. Also a big thanks to Janelle for teaching me about what I could do with a microscope and giving me feedback on this post. Mat found two really interesting blogposts on data storage. The first one tells a strange story about how sapphires are an incredible stable way of saving data. The other is just as interesting from EteRNA perspective. Harvard scientists have succeeded storing a complete book in DNA and they even got the pictures along. On top of that they have achieved breaking another book record. It warms my librarian heart when books and biology combine. Mat added a new tail to this story. Turns out that quartz glass is a candidate for storing data too. I bet it is cheaper than Sapphires. JandersonLee found the continuation on the story on the Harvard guys incoding books into DNA and how DNA can be used as storage media. I am currently reading exacly this book that gets mentioned in the story that JL found and got myself a real good laugh when I saw the carefull instructions on how to encode the book into DNA. How did they manage the book? Did they assign letters their own codons or did they take a binary version of the book and assign codons for 0 and 1? This paper holds the answers to your questions. I am not sure if there is public access to it. If not, go to a library that provide access. Starry sent me a funny page. Turns out the periodic table table has got company. This sent me on a Google picture search to see if I could find some other fun ones. First I found the smallest one ever. It was etched onto a human hair. See the story behind in this video. But I also ended up finding the coolest hack of the periodic table I have yet seen. 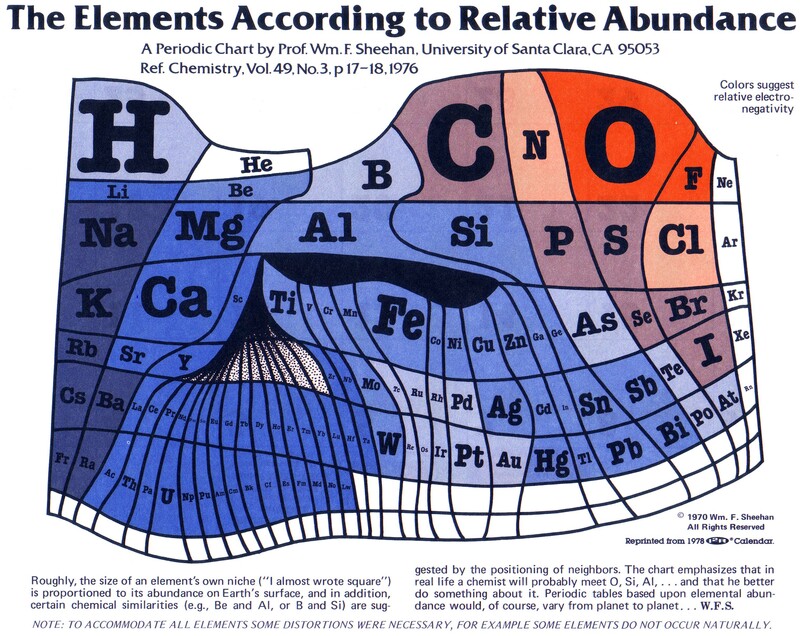 This periodic table shows the abundance of an element. But it also shows if the element will be electronegative or positive. All the blue are positive. All the red/purple negative. There are relatively few reds making it easy to remember. As Starry sums it up, the ones to the right are negative. The few white colored elements are noble gasses, except for funny Helium. I asked myself and the web, what elements do RNA consist of? The web answered: Carbon, Hydrogen, Oxygen, Phosphorus and Nitrogen. All of those elements, except hydrogen, are negative. So all I need remember for RNA is that Hydrogen is positive. I printed the table. Suddenly it is a whole other experience when I read biochemistry books. It makes the positive and negative thing about chemistry much easier to grasp and I get a feel for what pairs with what and why. Basically this periodic table helps me decode what I read about elements and combos of them. If you want to remember the elements of the periodic table, try out this memory course from Memrise. If I remember my college chemistry Carbon can be an electron donor *or* an elector acceptor, but it mainly prefers to form covalent bonds. Covalent bonds are typically much stronger than ionic (charge based) bonds. In a covalent bond, the electrons are shared between two atoms, whereas in an ionic bond, the electron is largely "donated" from one atom to the other and the electrical charge difference is what holds the ions together. Salts are formed with ionic bonds, and can usually be "dissolved" in water since water molecules are slightly polarized themselves, and water often has trace amounts of H+ and OH- ions as well. Organic chemistry is primarily the chemistry of carbon chain (and ring) molecules and those are formed with covalent bonds. That strong covalent bond coupled with the tinker-toy hub atom carbon are the "backbone" of life as we know it. And water (particularly salt-water with lots of free ions) is literally the sea of life! To a chemist, acids are substances that dissociate in water, releasing hydrogen ions. (H+). Actually this periodic table helps me understand bases and acids better. Now, when I see an OH group, I know they pair up because one is negative and one is positive. I printed the periodic table and had it beside me when I watched this video about the structure of RNA. I also better understands that OH groups are soluble in water, as water molecules with two H (+) and one O (-) are positive and negative, and thus can pair up with the O and the H in the OH group and then drag them apart. The human genome has twice as many genes than previously thought. Mat found this video Human genome 'more active than thought' from BBC. The human genome is packed with at least four million gene switches that reside in bits of DNA that once were dismissed as “junk” but that turn out to play critical roles in controlling how cells, organs and other tissues behave. Janelle shared this interesting article Guess What's Cooking in the Garage. It follows a do it yourself geneticist girl, who is trying to make youghourt glow in the dark. Janelle mentioned that the article holds a recipe for extracting DNA. Here is a NOVA video demonstrating how to extract your DNA in short simple steps. I found an interesting BBC documentary by the scientist Adam Rutherford. He investigates what can been achieved with synthetic biology. Mat and I have been talking about games and education for some time. One school have already taken up this challenge, with the aim of making the achievement of knowledge into a game. Check out their somewhat different curriculum. As a continuation of our discussion, Mat shared some really great news with me. Jieux: Kids might start getting addicted to education.... then what would we do? Jieux: how would we get kids out to the playground? Jieux: we could play "chase the ipad"
I think what can be done for education with games and science television like NOVA, will be a huge inspiration for children. Games and tv has an engaging power that most children don't get from reading about the same in a book. When you are first inspired and tuned in to a topic, you don't really care how many science papers and chemistry books you have to go through afterwards. Because you understand why you are doing it. Enchant us, engage us and then challenge us. Just after our talk about games and education Mat heard this great news on the radio, about kids "Gaming their way to better hearing". He also found this one that answers the question: Can gaming help kids learn? Nascarnut asked if I had seen the article on the gold eating bacteria. I had not, but it definitely sounded interesting. hotcreek: 0.o they eat gold? nascarnut: Yep, they disolve it and redeposit it. They always thought it was just a geologic process. This certainly adds a twist to how the big deposits are formed. nascarnut: Long as they stay away from my computer processor. hehe. nascarnut: Or my gold fillings. Thanks to Hotcreek for the title inspiration. Nascarnut sent me this interesting article on how uv-light may have kick-started the making of the building blocks for life. The other day I read an article about how scientists have found a shortcut for making cytosine from scratch. Why is all this interesting? Because it might hold part of the explanation of how life originated. Also these late discoveries follow in the footsteps of Stanley Miller's experiment with making primordial soup. Back in the 1950's he was investigating how many of life's building blocks could be made, starting out with just a few chemicals. Lately his old experiment got a nice twist as his student discovered that more building blocks were present in the old samples from the original experiments. Mat just sent me the third nucleotide to the above collection, already counting guanine and cytosine. Here is an article on how uracil can get made. Eli Fisker: I just found the coolest article. Do you know how long a half-life DNA has? Eli Fisker: And I'm sure some scientists will manage to put some dinosaur DNA into some birds and voila, bonsai dino. macclark52: So when I am 521, half of my DNA will be garbage? Lately I have been searching for documentaries about life on the microscopic scale. Microscopic Movie Stars is an introduction to the story about filming microscopic creatures and one of its pioneers. Mat pointed out the Gregarine at 1:51 as being very different. There is certainly something alien to it. I also found something that I had only hoped for. The Secret Life of Plankton is the best narrated and most beautiful movie I have encountered on microscopic sealife. This piece is art. I loved what agastya13rao wrote in the comment section: What planet did they shoot this one on again? Xaner, one of our newer players, recently introduced me to an article about eterna I had not heard about. It came from Labtimes, which is a biotechnology magazine for students and scientists. I took a look at the online version and I found the article Magical Microbial Moments. It is about the first ever microbial olympics held. This is funny reading. While we are on sports and microorganisms, I found another fascinating article some time back. It is about some fast and furious bacterias operating at the fastest physically possible copying speed. Good old RNA is even faster than bacteria at copying, though MicroRNA's were called ”the new kid on the genomic block” in a podcast title. Thanks to Mat for giving me the idea to put in a picture of Photobacterium phosphoreum. Here is the best news I have yet heard about Extreme microscopy, as it is called in an article that Mat found. "New IBM microscope technique has resolution 100 times smaller than an atom"
This will give scientists a new strong tool for measuring and exploring on the nanoscale. Brourd dug up the news that DNA can now be photographed directly with an electron microscope. As the article states, previously scientists had only seen DNA's structure indirectly. I found an article that has direct relevance to our work with RNA switches. Stanford scientists are lucky -- they got to watch RNA folding live. "We were the first to actually see a riboswitch switch"
I found a small series of beautiful educational videos on biotechnology. They are an visual tour in the cell and the parts in it. The first one is a fine introduction to what biotechnology is. There is also one on the Structure of RNA and DNA. You can find the rest of them on youtube or in Educational resources where I collect good teaching videos, articles and science papers on RNA and related topics.